The problem in education is, too often, the current school system doesn’t actually add up to the sum of the parts, that is, the quality of the individual teachers in it are actually better than the system overall. The education system is currently nowhere near producing a synergistic professional capacity greater than the people working in it. Too many teachers are still not able to perform at the optimum level of which they are capable. Over the years politicians and school leaders have introduced a series of piecemeal changes that don’t link together into a coherent whole. What is required is whole system change in a coherent, timely and appropriately paced manner. The time scale for this is decades not years hence the need to start now. No system can exceed the quality of its teachers. I take this as almost a universal truth. However, in sport some teams are actually better than the sum of their parts, the Greek European Championship winning team of 2004 comes to mind. Creative, committed, capable people working within a team structure and philosophy, that clearly guides but doesn’t rule their actions – the what, why and how we do things around here – leads to an enhanced coherence and improved outcomes from the synergy developed. #Vis2040: Island of Archipelago Education? 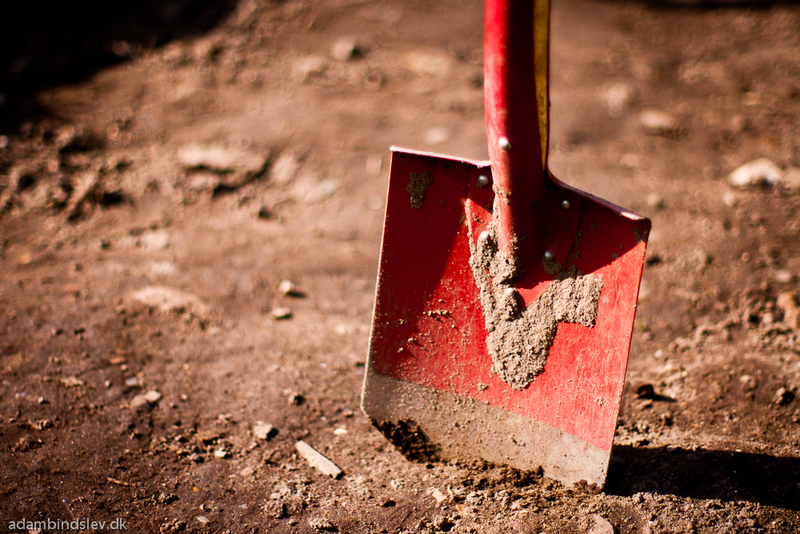 Creating fertile conditions to grow the teaching profession – the spade work. (In this post I looked at the rationale for local clusters/families of schools to be the key building blocks within the school system. This new middle tier would be held accountable for outcomes. Local clusters of schools would have the autonomy to act together powerfully within a tight, deep but outward facing partnership. This is the fertile ground in which we can build professional capital). #Vis2040: Our Top 3 Priorities: Teacher Quality, Quality, Quality. Selecting the best and helping them get even better. #Vis2040: The Inverted Doughnut Curriculum. Defining a powerful knowledge core with “ands” not “ors” plus what politicians should make decisions about and what they should not. (Building on the two previous posts this suggests a National Curriculum based on conceptual and procedural knowledge with space for professional judgement to build a coherent whole. Time for false dichotomies to become “as well as” thinking. The inverted doughnut analogy can also be useful in thinking about what politicians, school leaders and teachers should do – distinct but connected parts of the whole). In England we are currently failing to attract, train, retain and then develop our teachers at a sufficiently high enough level. You cannot create a high performing school system without great teachers. As a profession we are good but not yet consistently great. A high quality teaching profession is not created in a vacuum nor by serendipity – we need both a national policy for the supply and pay of teachers and a local system for developing teachers and building the professional capital required to become great. “In some countries, such as Finland, Japan, and Singapore, teaching is such a high-status occupation that recruitment into the profession is highly selective. For countries in this position, the quality of teacher preparation, and the quality of continuing professional development is almost irrelevant. If you can persuade the smartest people in the country to want to be teachers, you will have a great education system. Rather than heavy formal accountability, Finland applies restriction particularly through initial teacher education – only 10 per cent of applicants are accepted, and these are selected on the basis that they genuinely love teaching and have high academic attainment. And there are five years of teacher training – dual track – in subject specialism and learning approaches. Tough Young Teachers may make great television viewing but it doesn’t necessarily make great teachers. The Teach First route into teaching is possibly half baked – half brilliant, half ridiculous. Teach First is confused, it attracts the top graduates (brilliant) and then chuck them into the classroom with very little training or development (ridiculous). If teaching is easy, hence very little training is required, then why do we need top graduates? If top graduates are required then teaching can’t be that easy so we need to develop and train them properly – let’s make up our mind. 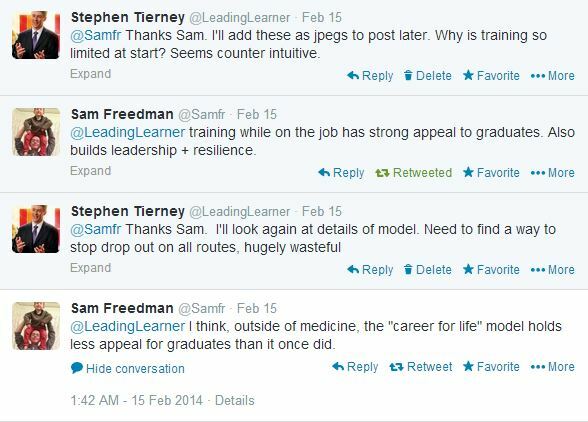 (See Postscript with some thoughts from Sam Freedman (@Samfr) Director – Research + Impact @TeachFirst. To attract the very best and brightest graduates and then throw them in the class room after six weeks training is simply unacceptable and undervalues the professional skills required to become a teacher. This isn’t just simply a Teach First problem as the various statistics around drop out rates for other routes, which I’ve picked up from various blogs (appreciate this is not the most profound research), seem to suggest something very similar for PGCE courses and I’ve no doubt Schools Direct. The bottom line is none of the current routes are of a sufficiently high quality to be retained. However, all of them beat putting unqualified teachers into the classroom by a garden mile! It is time for teaching to move to the high status profession that we require it to be. Graduates from 2018 should be required to hold a higher second class degree or better. All young people entering university in 2015 will be aware of this requirement at the start of their degree courses. Recruitment to the profession needs to get tougher and more exacting. Initial teacher education and training needs to be extended with the cost borne by tax payers not individuals. As long as the teacher stays a pre-determined time, within the profession, the initial investment will be repaid. We also need to be clearer about what it is we want teachers to know, understand and be able to do throughout their career and at the different stages within it – a Curriculum for Teachers’ Professional Development, if you like – that provides a framework for continuity and progression in a teacher’s professional development throughout his or her career from start to finish. Dylan Wiliam (2010) states that simply changing the entrants into the profession is not enough, we need to “love the ones you’re with”. For countries not in this position, efforts to raise the status of the profession are essential, but changes in the entrants to a profession take a very long time—typically of the order of thirty years—to work through and are of limited impact … The effect of this—over thirty years—would be to increase teacher quality by just 20% of the current gap between teacher quality in Finland and teacher quality in the UK … Our future economic prosperity therefore requires that as well as improving the quality of entrants to the teaching profession, we have to make the teachers we have better – what I call the “love the one you’re with” strategy. In teaching we need to develop a mentality that very high quality professional development is an entitlement and the absolute obligation that each teacher must build her/his personal capacity, as a way of substantially enhancing the professional capital within the system. Many professions have a set of post entry professional examinations which are sat as and when a person is ready. Passing the assessment doesn’t automatically mean promotion to a higher level or salary but it is a prerequisite for applying for these positions. If we are serious about “loving the ones we’re with” we need to make teachers’ professional development a top priority. This includes putting in place a properly structured and defined “curriculum” for their professional development. I’ve always seen the role of “people developer” as one of my key leadership functions, and that of all leaders, as well as painting the vision and holding people to account. These elements should be developed both theoretically, in partnership with universities, and practically in the class room or school. There is a need for universities, teaching schools and schools clusters to work together on the implementation and assessment of a national framework of teacher development. Local clusters of schools would be responsible for developing a local professional development curriculum, using the core curriculum produced nationally, encompassing the professional assessment framework which would operate at a regional level initially with the higher professional qualifications national level. The current franchise model for the delivery of the National Professional Qualification for Middle/Senior Leaders presents a possible mechanism and starting point, that many readers might be familiar with, to build upon. Inspection of a cluster of schools and re-licensing of their governance would be strongly based not just on student outcomes but the quality of professional development for staff and their contribution to building professional capital within and for the benefit of the system. Clusters have advantage of having the capacity to develop professional development opportunities that single schools don’t possess. Clusters of schools could choose to work together, potentially with a teaching school as facilitator, to produce cross-cluster professional development curriculums and deliver them collaboratively. In The New Professionalism – Reimagining the Profession I made some suggestions for restructuring teachers’ pay. In short, I proposed four fixed pay points with a new “Chartered Teachers” grade. Some of the more radical thinking, for the early years within the profession, is summarised in the table above. Attracting the very best graduates, through economic upturns and downturns, will require a much enhanced starting salary. Another important point is that teachers in their early years must be given additional time to start developing the skills upon which to build a successful lifelong career in teaching, if that is their choice, and the professional capital needed in a high performing school system. I accounted for this additional pay and time, in the early years, through removing UPS 3 and assuming that there is no extra money on the table in what are austere times that may continue for many years yet. Alternatively, the enhanced starting salary could be afforded through rethinking leadership & management (TLR) allowances and integrating these into a revised pay & conditions structure. A new Chartered Teachers status was proposed with these teachers working within and across the local clusters of schools would take a lead responsibility for coaching and mentoring of teachers. The potential for them to also act as agents of knowledge capture and transfer is a very obvious additional benefit. By 2040 we need to have resolved this. I don’t think suggesting teachers working more hours is sensible nor is it congruent with making teaching a high status attractive proposition. We need some different thinking with possibilities of teaching larger classes but with greater non-contact time for planning, assessment and professional development or increasing the number of mandatory training days on which planning and professional development could take place have been mooted in various quarters. Whilst not exactly being welcomed with open arms by teachers at the moment by 2040 they may well be seen as less contentious or even common place. Michael Gove has worked on structures, though some of the wrong ones have been developed with free schools and single academy trusts unlikely to provide fertile ground for developing professional capital whilst Teaching Schools are beginning to operate very effectively in many parts of the country. Tristan Hunt suggested a teacher licensing scheme which will probably end up a bureaucratic box ticking nightmare but his key issue of enhanced professional development for all teachers is sound. It is this lack of coherence in politically policy making that is partially responsible for holding the profession back. Vision 2040 needs to consider how we create the structure, culture and conditions for excellence for all in education. The development of local clusters and families of schools with the capacity to develop and implement a professional development curriculum for teachers from the start to the end of the profession would have massive impact. A national College of Teaching to develop a core National Professional Development Curriculum for Teachers and administer the professional qualifications for teaching, as an independent body, would be a prerequisite. From 2018, all new entrants to the profession will require an Upper Second Class degree or better with a starting salary of £25,420 (current M3 equivalent) and additional non-contact time for teacher development in the second and third year of teaching. A core National Professional Development Curriculum for Teachers, introduced in 2018, consisting of subject based, pedagogical and leadership elements with professional qualifications, both theory and practice, linked to four point salary scale. Joint working between the College of Teaching, universities and local clusters of schools to implement a local professional development curriculum to all teachers. No change to current teachers’ pay & conditions though the option of transferring into the new pay & conditions, including Chartered Teacher status, if an individual wants to. #Vis 2040: Island of Archipelago Education? « #Vis2040: Island or Archipelago Education? This is just a comment on some details setting out how Initial Teacher Training looks now. I haven’t digested your bigger ideas yet although there are several things I like in there. You’re correct that drop out rates for Teach First and traditional ‘Core’ PGCE routes are similar. The third route is School Direct (not Teach Direct) and that ran for the first time last academic year so it’s too early to know. There is a fair chance SD drop outs will be lower as it tends to be more attractive to career changers and people already working in schools than the other routes and they may be (a) more resilient (b) more financially committed (c) more aware of what they are letting themselves in for. I think that was the GTP experience (the forerunner to SD but on a much smaller scale). But having said that, as it expands, we’re seeing a lot more fresh graduates for 2014/15, and there is nowhere to hide on SD if it doesn’t go so well – no chance of a clean slate or switched placement. Some Teaching Alliances and SCITTs are taking more of a Teach First approach and giving SD teachers big timetables and minimal training. I’m aware of one Alliance that does 1 day of induction, with whole class teaching starting on day 2 (Teach First at least get six weeks!) and some SDs are given 80% timetables. However, there are other Alliances that take a much more Core PGCE approach with the SD teachers starting out with observation, LSA roles, and small group teaching, building up through running starters or plenaries, and then picking up whole class teaching as they become ready. Some Alliances run really excellent training sessions; some are much lower quality. Some chuck their SDs in with NQTs; some don’t. There was at least a requirement for 60 days dedicated training for SD but the NCTL have just removed that. I don’t know about SCITTs as we don’t work with them but I should think it’s the same picture. Essentially what I’m saying is that, following the changes to ITT, there is a lot of variability in what’s going on. Teach First have got the image, and the recruitment right, but not the support in school and the matching of teaching load to preparedness so when it goes wrong everyone involved takes a big hit. SD, when delivered well, offers the greatest potential for training that’s fully integrated into a school with input from all the best teachers and 360 support for the trainee, but the quality is massively variable. Alliances also really struggle to deliver subject pedagogy training because they only have a tiny number of SDs in each subject. Core PGCE benefits from the massive experience of HEIs in delivering training and support, used to have decent cohorts for subject pedagogy (though SD is scuppering that), has the two placements which give more options and wider experience, but depends hugely on effective partnership with schools and can suffer from lecturers who have been out of the classroom for a long time. Quite what will come out in the wash is hard to say but the profession needs to be alert to the view in the DfE that the traditional training model is a lot of faffing around, that recruits should be in schools and learning by doing; and that there isn’t much to learn about teaching that an Oxford graduate with a 2.1 in English doesn’t already know. I think Wilshaw knows different and the zeitgeist in the profession is in the opposite direction but ITT and CPD for teachers may not be heading in the direction you would like. There is a lot in your comment, as I sometimes say, a blog post in its own right. High variability in ITT should be worrying us all far more than it currently does. We need to see building in quality as a system thing not an idiosyncratic preference if we want real quality. Your examples really help give readers a sense and scale of the problem. I hope we start heading in the right direction before too many young people’s education is damaged. Thank you for pointing out my error, I’ve corrected it now. This is a brilliant post, Stephen. For a while now, I have been thinking about what a professional development curriculum for teachers might look like. CPD is so piecemeal and there is huge variation between what schools offer within the same borough or county. There needs to be a core set of CPD entitlements that schools deliver for their staff. We have to love the ones we’re with, as you say so eloquently. Let’s hope we see this happening before 2040! Great to hear from you Debbie. You’re right 2040 is too long off for us to wait and do nothing. I hope to have a bit of time and space to start giving some serious thought to this next year. Even better I hope the Royal College of Teaching will beat me to it.